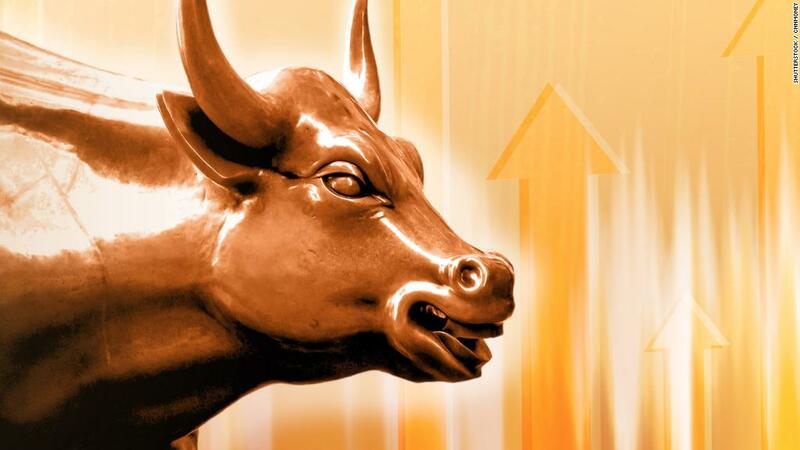 The market's latest milestone came just after the opening bell Tuesday and easily set the record for the fastest rise between 1,000-point barriers. The Dow has been around for 121 years. 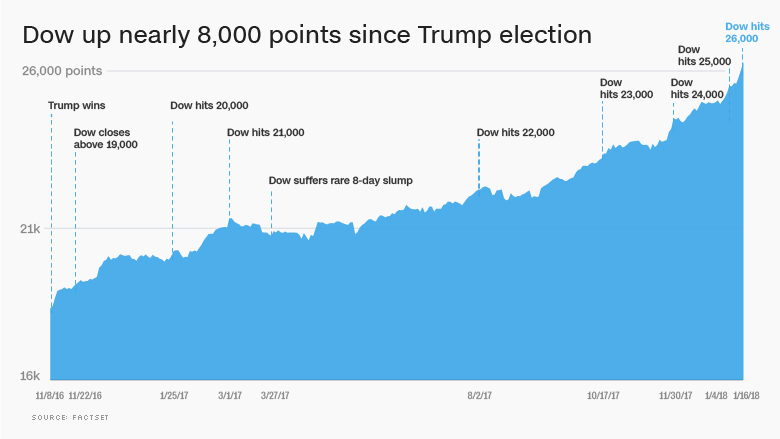 The trip above 26,000 was brief: The Dow lost altitude throughout the day and closed down, erasing a gain of nearly 300 points. There wasn't an obvious catalyst for the pullback. Still, the Dow has spiked more than 7,000 points, or about 40%, since President Trump's election. The stock market boom reflects enormous excitement on Wall Street about record corporate profits and strong economic growth at home and abroad -- all of which could be boosted by the GOP tax overhaul. "The market has certainly come out of the gates fast in 2018 after a stellar 2017," said Art Hogan, chief market strategist at B. Riley FBR. It's true that 1,000-point milestones come easier at these lofty levels. On a percentage basis, it's just not nearly as big of a move as it was from 10,000 to 11,000. Still, the relentless surge is raising concern even among some bulls that things are getting out of hand. That thinking may explain the more cautious tone in afternoon trading. Ed Yardeni, president of investment advisory Yardeni Research, told clients in a report on Tuesday that he believes the market is in a "melt-up." That's a rapid price increase based on emotion -- fear of missing out on gains -- rather than on old-fashioned fundamentals. "I'm not a big fan of melt-ups," Yardeni wrote. "They tend to be followed by meltdowns." Michael Block, chief market strategist at Rhino Trading Partners, said the "fear of missing out is resonating," if not "screaming." "I just question whether this is too far too fast," Block wrote in a note on Tuesday. Some stocks are up even more than the Dow since Trump's election. Amazon (AMZN) has zoomed 65%, Netflix (NFLX) has spiked 80%, and Nvidia (NVDA) has skyrocketed 213%. It's not just tech. Look at Bank of America's (BAC) 83% rise or Best Buy's (BBY) 90% surge. "We're just starting to see Corporate America tell us what a lower corporate tax rate means to the bottom line. We shouldn't dismiss that," said Hogan. The S&P 500 hasn't declined 3%, either in a single day or over several days, since early November 2016. That's the longest period of calm in history, according to Bespoke Investment Group. More impressive: The S&P 500 hasn't suffered a 5% pullback since June 2016, weeks before Trump secured the GOP presidential nomination. It's the second-longest such streak ever, according to LPL Financial. Dan Suzuki, senior U.S. equities strategist at Bank of America Merrill Lynch, thinks the market is experiencing a "melt-up" and investor sentiment is nearing "euphoria," though it's not quite there yet. The S&P 500 has quadrupled from its bear market low. But the gains have clearly accelerated since Trump's election. "It's an extremely impressive rally," Suzuki said. "It's pretty indicative of what you see at the end of bull markets when sentiment is in the driver's seat."